The Municipal League Foundation – a non-partisan citizen watchdog organization, released a follow-up report this week on Metro’s progress in making key reforms in four areas of its operations — performance measurement, service policies, strategic planning, and transparency. The Muni League also noted that Metro has faced significant challenges, primarily due to lower than expected revenues resulting from the recession and the slow recovery since its initial report was released four years ago. 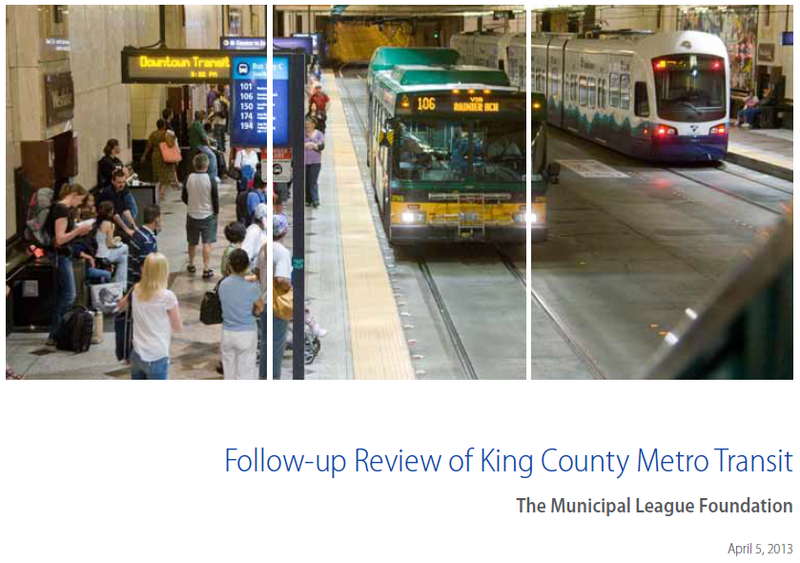 The Muni League report points to additional factors that contributed to changes at Metro, including a King County Council-initiated performance audit identifying areas for cost savings, operational efficiencies and the work of a Regional Transit Task Force that called for major policy changes that were ultimately adopted. The follow-up report also offers suggestions on ways Metro can continue to improve accountability and transparency. “I’d like to thank the Municipal League Committee for its invaluable input that has made us a stronger and better organization,” Metro General Manager Kevin Desmond said.